I can't tell you how long Kaye Wilkinson Barley and I have been online friends. We've never met, but I know that if we finally do, we'll meet with a hug. So, there's no FTC warning about this interview. I've appreciated Kaye's opinions on DorothyL. And, I love to see the pictures of her beloved corgi, Harley. He's the most photogenic dog I've ever seen. I've done a couple guest blogs at Meanderings and Muses, her blog. Now that Kaye is a published author, it's time to turn the tables, and ask her a few questions. When she self-published Whimsey, I was upset that my family couldn't read the book because they don't use e-readers. Now, Whimsey is available through traditional sources for those who want to read an actual paper book. So, thank you, Kaye, for the book, the interview, and your friendship. Lesa - Kaye, for those readers who don’t know you, tell us about yourself. Please tell us where you blog as well. Kaye - Hmm - that's really not as easy to do as it sounds! Okay. I ive in the North Carolina mountains with my husband Donald, and our corgi Harley. I’m retired and I am loving it. I’m not blogging as much as I once did, but my Meanderings and Muses - http://www.meanderingsandmuses.com/ - is still a spot for guests to come hang their hats once in a while, and a place for me to post photos (mine and Donald’s) for the daily challenges in my photo group (which I dearly love!). I do still blog there, but it’s on a very loose schedule, i.e., when the mood (or a rant) hits. I intend to get back into it though – it’s not going to die. Not ever. It evolves, but it’ll never die. There’s a lot of my heart at Meanderings and Muses. Right now, I’m concentrating more on my new webpage for Whimsey - http://www.kayewilkinsonbarley.com – I’m doing a little blogging there. Mostly in the way of promotion, but also I’ve posted a couple pieces I hope will be helpful to other writers considering self-publishing and all the promoting as a self-published author. What I really, REALLY, wish is that I could afford a professional webpage designer to do the Whimsey page. It deserves better than my mediocre efforts. I’m trying to remember to post, both at the Whimsey site and at Meanderings and Muses, where I’ll be blogging while I’m promoting Whimsey. A lot of my blogger friends have been great about letting me stop by. Seems a little strange though with me being the guest now instead of the host. I’ve hosted just about every mystery writer you can think of at Meanderings and Muses over the years – along with other bloggers, reviewers and readers, and I’m quite proud of that. AND – I get to play with the very cool, very gracious, very talented Jungle Red Writers - http://www.jungleredwriters.com/ - on the first Sunday of each month. Lesa - What made you decide to start writing, and what led to Whimsey? Kaye - My very first forays into writing were in the form of blogs. I quickly fell in love with it. Having my own place to write about anything I wanted to write about was a lovely feeling. I had no idea if anyone would be interested, but I fell in love with narrative non-fiction. And I still love it. I had two of these pieces published in regional anthologies, and I will be as proud of those anthologies as anything in my life for as long as I live. Editors Celia Miles and Nan Dillingham took a chance on me and published the first piece, and then invited me to submit to the second anthology. I was grateful, humbled and tickled pink to have those pieces accepted. There’s a huge amount of talent gracing those pages. That, along with some encouragement from Celia, from Earl Staggs and Judith Greber and some others, got me thinking about trying my hand at fiction. I decided I would like to write a book I would love to read – which is, I think, the perfect reason to write. I am proud beyond measure of the final result. I would not have been, however, without the guidance of Earl Staggs who spent two years coaching me, teaching me, guiding me and editing my words. He was always ready for an encouraging word, and also always ready to shake his head when necessary and say, “no, no, this just won’t do.” I’ll be forever grateful. I adore Earl Staggs. And I adore Whimsey. Lesa - Tell us about the book, Whimsey, please. 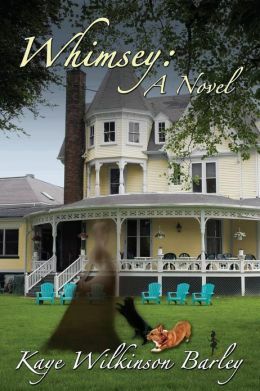 Kaye - WHIMSEY is a novel of southern fiction with a splash of magic and a touch of fantasy, topped with a sprinkling of humor. The magic was already there when cigar-smoking matriarch Elizabeth Calhoun established an artist’s colony on an island off the coast of Georgia and named it Whimsey. Elizabeth’s ghost still drops in from time to time to make sure things are going as she planned. There’s also a wicked pixie named Earlene who fancies tight-fitting designer clothes and Louboutin stilettos. Elizabeth’s grandniece, Emma Hamilton Foley, a once-promising jewelry designer who moved away from the island, now fears her talent has deserted her. Along with her four best childhood friends, she has been invited to be a resident artist at Whimsey’s new upscale gallery, Les étoiles. To join them, she’ll need to regain her talent, face the demons from her past and her feelings about Eli Tatnall, whom she loved as a girl. Will moving back to the Island of Whimsey bring the magic back? Lesa- How much of you is in this story? Kaye - I think there’s a lot of me in the story, Lesa. But not as one particular character. I’ve had people ask if I’m Emma. I’ve had a couple people assume that I’m Madeline. And only one person asking if I might be Zoe. I think there’s a little bit of me in each of The Wicked Women of Whimsey, and in Zoe and Zelda and Earleen. Even, I think, in Reese (but not much!). Lesa - You self-published Whimsey. What surprised you about the publishing journey? Is there something you would do differently? Kaye - What’s surprised me most about the journey is who was there for me in support and who wasn’t. I do not mean this as a criticism – there were reasons and they were valid reasons, but you know, I am the dumbest kid in town sometimes. I thought everyone would throw their arms wide open and cheer me on. I didn’t particularly care if they liked Whimsey or not – although, of course, you hope your work is going to be universally loved – but I expected . . . support. There are still people who I have conversations with who have yet to even give voice to the fact that I’ve written a novel. It doesn’t matter in the least if it sells one copy or however many – that fact is, I wrote a novel. I did it. It’s not an easy thing to do, and it’s something I’m proud of. Enormously proud. To have that accomplishment dismissed and diminished has been hurtful. Of course, there’s the other side of that coin and those people who have supported me and cheered me on and have been there with advice when I’ve asked for it, and Lordy – blurbs from Margaret Maron and Hank Phillippi Ryan – how cool is that?! So, you focus on the good and move on from what’s not so good, and that which might be hurtful. But if anything, it’s taught me a very valuable lesson about not being too stingy with kind words – they mean more than people realize. Kaye - Oh my. Now, Lesa, you know this is an almost impossible question! Writers are my rock stars – I love ‘em! And I respect them. Every writer who has written something that has touched me, moved me to tears or laughter, or to think about a subject I might not have otherwise, has been an inspiration. Some are no longer with us. But the writers writing right now are many, and too many to name and be fair – and they range across all genres. I’m going to grab one name – only one – and you will know why as soon as you see it. Sarah Addison Allen. I can’t say enough about how much I love her work. When I read her books I am just transported to a world of magical realism that is just so lovely, so magical, but so – to me – believable, because I believe in the kind of magic she writes about so perfectly. When you, in your review of Whimsey, compared my work to hers, along with Ellery Adams (wow!!! ), you had no way of knowing that you had paid me the biggest compliment you could ever pay me. Another reader made the same comparison and really, that comparison is all I need to help me believe I’ve done something lovely. Lesa - What are you writing now? 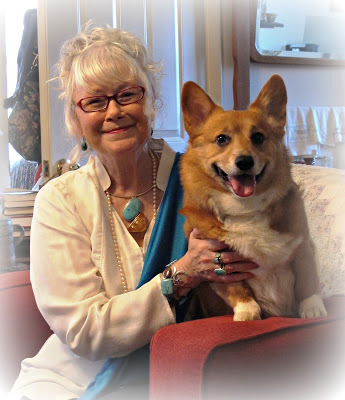 Kaye - I’m trying my hardest to write the second Whimsey novel. As you know, there are five Wicked Women of Whimsey. Book #1 focused on Emma. Book #2 is going to, I think, focus on Olivia. I’ve written the opening scene (a dozen times), but can’t seem to move forward because I’m spending a lot of time right now trying to get Whimsey: A Novel out there. I’m happy to say it’s now being picked up by some bookstores and that is such great news! Yay!!! If anyone out there who has read and enjoyed Whimsey would like to ask their local booksellers and libraries to consider ordering it I will be eternally grateful. Lesa - And, the question I ask every author. Do you have a story about libraries? Kaye - Oh, I do. You know me well (even though we’ve never met face to face – can you believe that?? ), so you know the home of my heart is where I grew up – Cambridge, MD. Cambridge had the most wonderful library. Perfect! It has a newer library now, but thank goodness, the old one still stands and is being used as county offices. Anyway (I ramble!). As I wrote at Jungle Red a while back, it also remains the quintessential library in my mind. When I walk into the brightly lit libraries of today they still surprise me a tad. And if I hear people talking loudly I'm surprised when no one behind the front desk says "Shhh." I'm an old fogey in this regard, I'm afraid, and miss the library of my youth. An old brick building with gothic arched windows, and worn wooden floors, tall dark oak book cases, corner nooks and crannies, and massive oak tables and chairs. I remember many an afternoon spent wandering aimlessly in this quiet place and browsing the shelves. There may have been books on those shelves I never got around to reading, but it's doubtful there were many I didn't at least touch. And now, my Whimsey is there. I love that . Lesa - Where is Whimsey available? Kaye - Right now Whimsey is available at Appalachian State University's Bookstore in Boone, NC, Black Bear Books in Boone, Mystery Loves Company in Oxford, MD, Laurel Bookstore in Oakland, CA and Quarter Moon Books at Topsail Island, NC. And at ArtWalk and Higher Ground Coffee Shop in Boone, NC, along with the Watauga County Library in Boone and the Dorchester County Library in Cambridge, MD. It’s under consideration at a few other places I know of, and hopefully at a few I don’t even know about. (If anyone spots it, please let me know!). I joined SIBA and have sent all 250 bookseller members a sell sheet – some of that is beginning to look like it might happen (see what I mean about being busy doing promotion?). Cross your fingers!! It’s also available in Kindle form, and at Amazon and Barnes and Noble. Lesa - Kaye, thank you for taking time to answer questions. I know that's a change for you, but now that you have a book out in the world, you better get used to it! Kaye Wilkinson Barley blogs at http://www.meanderingsandmuses.com. Whimsey by Kaye Wilkinson Barley. 2013. Lesa, it IS a change! But, you ask great questions and it's always fun to spend some time with you. Barb, HEY! Thanks for stopping by. I'll see you at Malice! I don't know how many comments you'll get today, but just wanted to let you know people are reading it. Hugs to you, Donald, and, definitely, Harley! People do not seem to leave comments too much anywhere much any more, I don' think. I keep an eye on my blog when I have guests and while there are not many comments, there are plenty of hits - and that's what counts. But thank you for letting me know! What a delightful interview between two of my favorite online friends! Kaye, we met ever-so-briefly at Malice last year. Congratulations on Whimsey -- and yes, your sweet Harley is such a picturesque little dog! Leslie, I remember and I look forward to seeing you again this year. For a little longer visit this time! and thank you for the kind words. Just want to say Hi! Read your interview. Lesa, thanks for hosting Kaye. Kaye, congratulations again on publishing this charming book. Wishing you much success and looking forward to many more books to come from you. Thanks for stopping by to read the interview with Kaye! Hi, Betty - Thanks so much for stopping by. Mason, Hi! Thank you so much. And, Lesa, Thanks again for having me - SMOOCHES! I'm coming in late as usual, but just wanted to say I found this post very interesting and inspiring - I will look out for this book, and also for your blog, Kaye. Good luck with your next work!